CurseForge does not permit me to upload .twld files, because it doesn't recognise the file format. Without the .twld file, the map's assets will not load properly. First off, take note that you'll need to have installed the Thorium and Chad's Furniture-and-More mods in order to run this map! Thirdly, make sure you copy the .wld and .twld files to your modded "Worlds" folder and let me know if there are any missing textures, items, bugs etc. Do you enjoy RPG games? Have you ever wanted to role-play as (for example) an undead pyromancer, but been frustrated by not having the appropriate vanity items or accessories at the outset of your Terraria play-through? Do you want to try a play style that you haven't experienced before? If you answered "yes" to any of these questions, I recommend you give this map a try! I've created an RPG map with several races and factions to choose from. 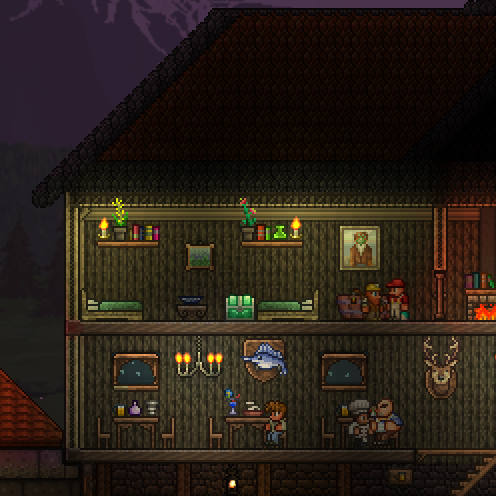 This is not a mod - instead I've used accessories and vanity items already within Terraria in order to give each race its owns perks and attributes. You may choose between Human, Wood Elf, Undead, Merfolk, Trollkin, Celestial and Werewolf. Currently there are 7 factions/professions to choose from, including Hydromancer, Gunslinger, Blademaster, Technologist, Witch Hunter, Paladin and Warlock. It's the ideal map to try in multiplayer mode! Nevertheless, I wanted to upload this map now in order to get feedback and find out whether the project is worth pursuing. Do you enjoy this sort of map? Would you like to see it updated and completed? Do you think I've made things too easy or too difficult? Constructive criticism is always appreciated! Final note - This is an Expert map, but the items given to you at the outset should mitigate some of the difficulty. This map is actually pretty good for the layout and lore for each faction, but I feel that it isn't specified enough to go and progress through the game or how. What other mods are required? In reply to iancooles: Just Thorium and Chad's Furniture.